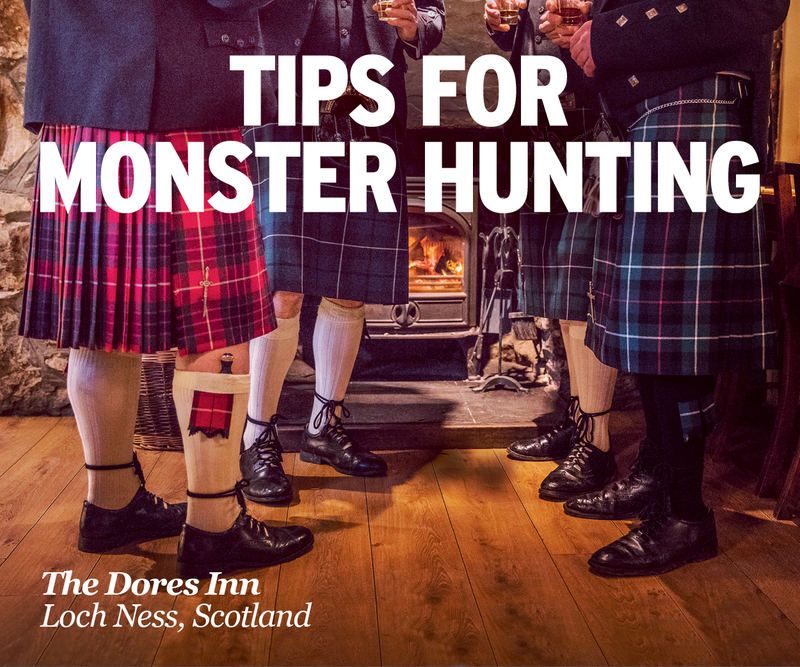 Looking back on 2016, Loch Ness and its Monster had a worthy list of events in and around the place to keep the subject and this blog busy from January to December. Let us now go over these in largely chronological order. January began with a big claim for a new record depth for the biggest loch in Britain. 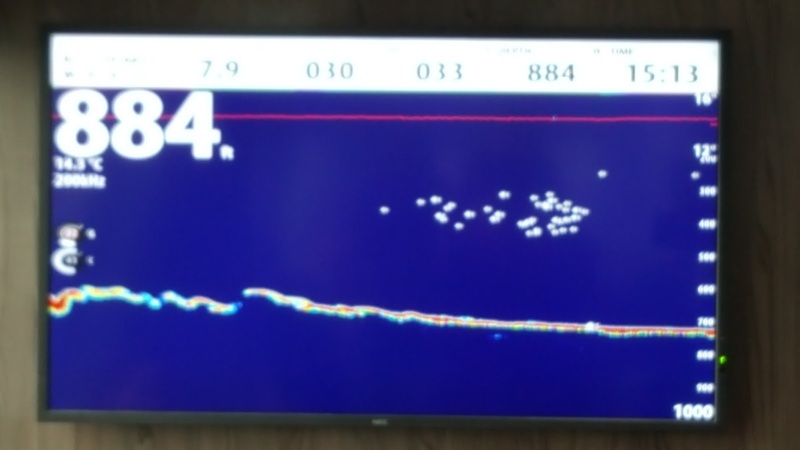 Jacobite Cruises went to press with the story that their new 3D sonar imaging equipment had detected a depth of 889 feet, beating the current record by 135 feet. The claim immediately generated controversy as others said they could not reproduce the result. I myself saw the sonar recording a depth of 884 feet back in September, when I attended a talk on the monster. So, there is no doubt the equipment was doing what was claimed and the talk was whether a minor quake had caused a collapse of the bottom silt near the Clansman Hotel. However, the lack of corroboration leaves this one a bit up in the air and so we move on. 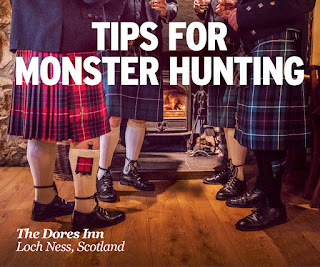 The month of March showed that despite sceptical assaults on the centuries old story, you can't keep a good monster down as the tourist agency, VisitBritain, decided to recruit the Loch Ness Monster for their promotion of the Highlands to foreign visitors. Admittedly, it was all a bit tongue in cheek, but more tourists means more chance of good videos and photos. Well, that is the theory, but the shortcomings of reality often intrudes on opportunity, be it distance, human frailty or poor equipment. A few weeks later in April came the sensational news that a monster had been found, albeit one that had sunk without trace over 45 years ago. I am, of course, referring to the model monster made for the 1970 film, "The Private Life of Sherlock Holmes". The prop did not actually appear in the film as it sunk before filming began. The relics of the prop had been found thanks to the latest in sonar technology in the form of a low flying sonar torpedo called the MUNIN Autonomous Underwater Vehicle. The missle's ability to draw near to target areas and produce higher resolution images was the advantage it had over previous searches. Which clearly begs the question as to why previous sonar missions should be taken seriously when they claimed to have swept the whole loch and found nothing. They did not find this because they lacked the acuity of vision to see this monster sized object. Whether such new technology will be used again at the loch remains to be seen. Meanwhile, pictures and videos purporting to be our favourite cryptid rolled in throughout the year. One of the first to "surface" was the webcam shot taken below by Diana in April of a strange looking neck like image. There were various such webcam shots that came to my attention over the year of varying quality, though the same conclusion applies to all. They may add to the story and the mystery, but they are too far away to provide conclusive evidence. Other pictures came to the fore although most were no more than interesting and even explicable by natural phenomena. A video by Tony Bligh in June is most likely just a boat wake,. A picture also taken in June by a Texan tourist appears to show a dark shape under the water, but is too indistinct to tell. 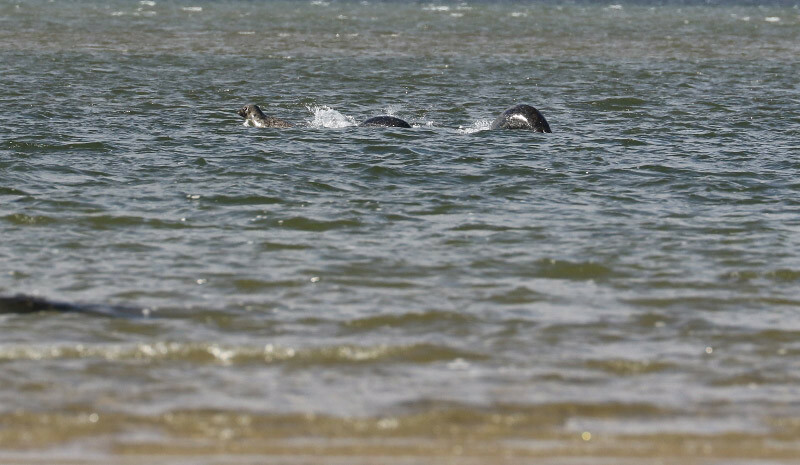 What was of more interest was a picture taken by Ian Campbell in August showing two strange objects swimming just under the surface opposite Inverfarigaig (below). The picture suffers from being taken at a distance of about 400 metres, although Ian Campbell was convinced it was two creatures. 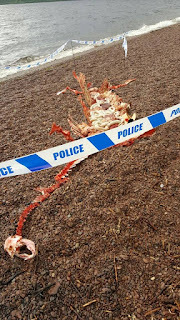 Meantime, a strange carcass found on the shores of Dores was fooling no one. 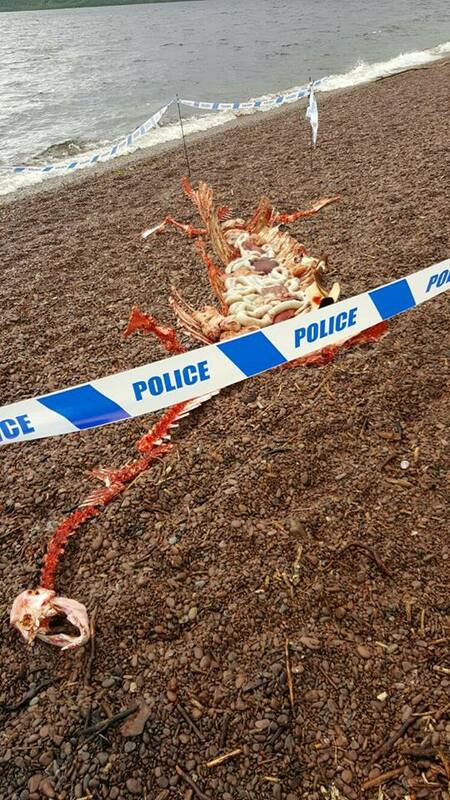 It was a publicity stunt for a forthcoming crime drama set by the shores of the loch. Likewise, a picture taken in September claimed as one of the clearest yet, was clearly a line of seals playing and pursuing. The only argument was whether it was taken at Loch Ness or near the owner's residence in the Cromarty Firth. The argument leans to the latter, but it is certainly no Nessie. 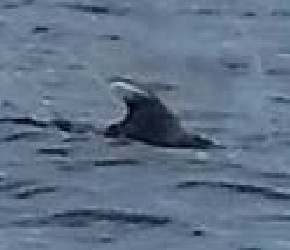 Of more interest was the dorsal fin most certainly photographed at Loch Ness on the 22nd August by Kate Powell which had echoes of the Adams-Lee photograph of the 1930s. Further analysis showed it was no photoshop job and most were agreed on that. What was not accepted universally was that is showed a dorsal fin. Indeed, the initial and well worn tactic of the sceptic was to first play the "Not taken at Loch Ness" card. This soon disintegrated when Steve Feltham produced the uncropped image. Panic soon set in as the prospect of a possible mystery stalked the sceptic and soon an alternative but pathetic excuse arrived in the form of an osprey taking a fish from the water. The answer is its own refutation, as they say. But you know why it is a stupid explanation? Because if you had said it had been taken in the Moray Firth, the same Nessie deniers would have unhesitatingly screamed "Dorsal Fin". Please! Now what this photo actually shows is another matter. 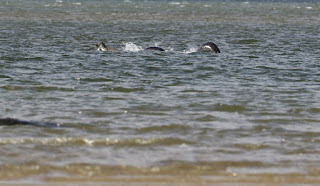 A local dolphin expert told me it was not one of the dolphins they track along the north east shores of Scotland. Bird? No. Dolphin? Maybe. Nessie? Not sure! On a personal note, the hunt and research continued in 2016. Several trips were undertaken to the loch such as in September. The use of trap cameras and the like continues, but no conclusive evidence was acquired, but information about the loch useful in important conclusions were indeed acquired. Some strange things were investigated, though not necessarily of a monster nature! Back at the desk and laptop, various advances were made in Loch Ness Monster research. After some pursuit, I was most pleased to make contact with H. L. Cockrell's son and obtaining a wealth of information on this famous photo of the monster - including the never before seen second photo. Sceptics don't give a rat's arse about pursuing such things, if you think it is all just boats and logs, where is the motivation? 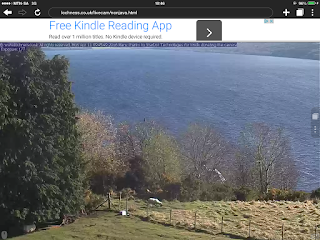 Leave that sort of stuff to those who believe there is something strange in Loch Ness. There is more to come on H. L. Cockrell in 2017. Continuing in the vein of those who do proper research, a couple of mysteries were cleared up which had lain dormant for decades. The long standing conundrum of John Keel's 1896 Nessie was resolved when I dug deeper into the archives. 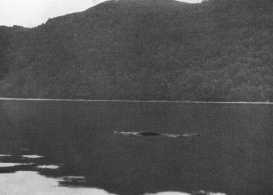 Likewise, Peter Costello's brief mention of another 1896 reference to a monster in Loch Ness was also proven to be true, though not perhaps in the way predicted by either side of the Nessie debate. Back in April, I also took part in a TV documentary on Nessie and delivered a lecture on the paranormal history of the Loch Ness Monster to the Scottish UFO and Paranormal Conference. Finally, I was pleased to renew my acquaintance with renowned Nessie researcher, Rip Hepple. I thank him again for his important contribution to the Nessie debate in the form of his 40 years of newsletters. And so, the year draws to an end and even as I type these words, another late news item on a possible Nessie sculpture hits the media. You just can't keep a good monster down! It was a good year in terms of events and things to debate. However, evidence which will convince even the most die-hard sceptic continued to elude. Mind you, since that probably means a monster carcass, they could be waiting a long time. I wish all readers a prosperous and healthy 2017. A reader called Liam emailed me with a link to an old October 1969 RTE TV report from Ireland which covered the visit of some members of the Loch Ness Investigation Bureau to the boggy land of Connemara in the west of the Republic of Ireland. The members interviewed were Ted Holiday, Holly Arnold, Lionel Leslie and Ivor Newby. Seasoned monster readers will be well aware of this trip as it was covered in Holiday's book, "The Dragon and the Disc" published in 1973. I refer you to that book for further details of the search for the Irish "Pieste". The picture of Ted Holiday above is taken from the video which you can view here.